Firstly, here is another Isager shade card. 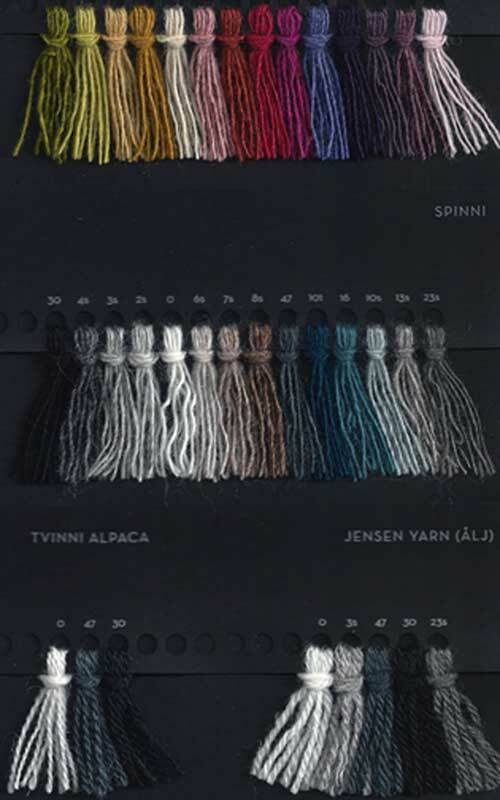 This one shows HIghland Wool ( top row ). this is 100% Lambswool that is spun in Scotland with 305 yards per 50g ball. 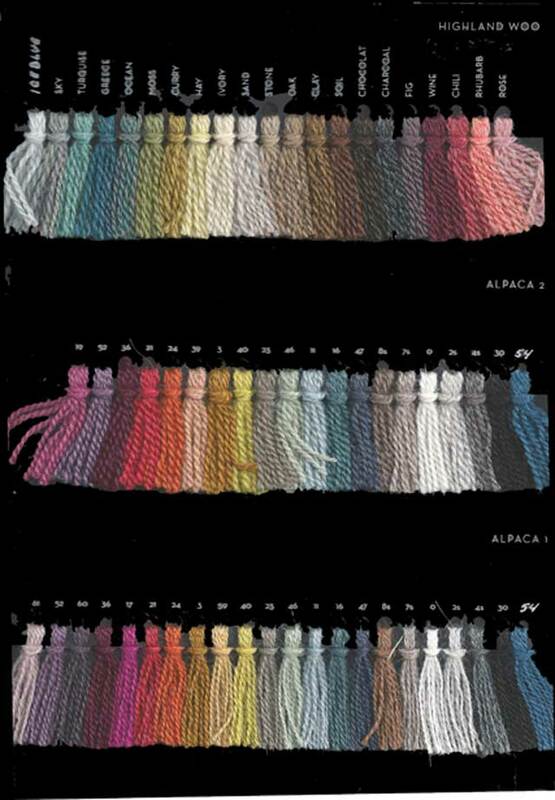 The next two rows show Alpaca 2 Ply and Alpaca 1 ply with 500 and 800 meters per 100g skein. These two can be knitted together to make a 3 ply weight. You must think of a new word to replace each of the clues. Then drop one letter from each of the new words and re-arrange the remaining letters to form the title of a book that features rabbits. So, you are looking for 5 new words to replace the ones above…remove one letter from each and re-arrange to form the book title! Answers to jannette@easynet.co.uk with Rabbits as the title by midnight Wednesday please! We went for the Chinese meal – I had soft shelled crab and John had butterfly prawns to start with, then I had jumbo prawns in honey and sesame seeds and John had chicken in black bean sauce. It was good – not too much and it did not taste of preservative like Chinese meals often do! I am cooking beef in red wine at the moment – think I will just sample the wine to make sure it has enough body! Back tomorrow. I am feeling a bit better today – my cold is going! However, I am mad at myself! Last night when I finished knitting I noticed that a cable was crossing the wrong way about 5 rows down. So, this afternoon, I have painstakingly taken it back stitch by stitch to the error. I have now re – knitted the row that I thought was wrong and it was correct all the time. The cables switch direction on this row – I was expecting them to go in the same direction as the ones beneath. Ugh! My love affair with cables is wearing thin! Now to the next contest with a prize of 2 balls of Rowan FIne Lace in the winner’s colour choice. The words OUR EASTER EGGS can be re-arranged to make the full name of a famous painter – who is it? Answers to jannette@easynet.co.uk with Easter Eggs as subject by midnight Saturday please. My Artesano yarn has not arrived – it says Delayed at Depot on the tracking information – I shall chase them up. Back tomorrow. I am still feeling like death warmed up. At least my throat is no longer sore but I am sneezing and coughing a lot. We still have snow here and a bitterly cold wind. I can’t believe it is Easter this coming weekend. And then it is April. The Royal Mail are re-structuring their prices from April 2nd. Instead of charging by weight with the prices increasing as the parcels weighed more, they are going to have 2 weight bands : 0-1kg and 1kg-2kg. This means that it will make light parcels a bit dearer but heavier ones will work out cheaper! This only applies to UK parcels as far as I know. I have emailed them for clarification. The Artesano sock yarn will be here on Wednesday – the colours are very nice and they have funny names like Kidney Bean and Cream Cake! No other news – back tomorrow. I have a cold. John has been coughing and spluttering for the last week and now I seem to have caught it too. I am buoyed up with Day Nurse to keep me going! Snowing here today and bitterly cold. John took me to the hairdresser as I did not want to get my shiny car wet! My Rowan special purchases have arrived…..Cotton Glace Candy Floss, Felted Tweed Chunky Mocha and Felted Tweed Chunky Grey Pebble. Those links will take you to the full packs of 10 balls but I have also got it for sale by the ball. Both Susan and Maureen go the last question correct. As this contest seems to have lasted for a very long time, I am going to give them one more question and then, if there is no clear winner, I shall send them both consolations prizes and start a new contest. So, Maureen and Susan – last one! Answers to jannette@easynet.co.uk with words in common as subject by midnight Monday! One small piece of news! Rowan Denim is discontinued! I am rather sad about that as it was a unique yarn.